'Burrwood', the Walter Jennings estate designed by Carrere & Hastings c. 1899 in Lloyd Harbor. Jennings was vice-president, director and secretary of Standard Oil. Click HERE for more on 'Burrwood'. Something of an "Idlehouresque" feel to it- too large, too bulky and too ponderous. I wonder if the garden pictured here is an Olmstead creation? it doesn't look like their work, or, frankly like a private garden to me. It appears much more like a public park in a very prosperous Edwardian city. I know, i know, everyone's a critic. It was indeed Olmsted. I believe their archives in Brookline, Mass. have a bunch of records on Burrwood. Jennings had murals painted in his bedroom depicting The Seven Wonders of the Ancient World. Above the fireplace he added an eighth -- "How I Made My Fortune." A couple of the outbuildings still exist. Ancient- that is priceless- and says a great deal about how many plutocrats view themselves and their place in the world. A dear friend's mother takes the opposite tack- a favorite expression of hers is "You can tell what God thinks about money when you see who he gives it to." Security word of the day: Witynes- A clever attestant. I had a tour of the house and interiors many years ago when it was a home for the blind. Yes, it was overbearing from the entrance. seemed to tower above you, but the interiors where still very much intact and the setting was beautiful. Many of Carrere & Hastings houses are institutional in scale and many of their country houses would fit well in a urban location. The New York Public Library on Fifth Avenue and the Frick Collection are perfect. Jennings took himself very seriously. He once conceived a hatred for one of his neighbors -- a woman who lived, as I recall, south of Burrwood along Shore Road. He had Standard Oil build an enormous oil storage tank just offshore to spoil her view of the harbor. Building off of The Ancient's story...I had heard that Otto Kahn had wanted to join their beach club at the end of Shore Road but because Kahn was Jewish he was denied entrance. I believe Jennings was in charge there. In retaliation Kahn built another oil storage tank for a competing oil company down on Shore Road so Jennings could watch their barges sail past his house (and ruin the view from the bottom of Shore Road). I can't remember where I heard that. At a summer cocktail party, some decades ago, one of my relatives gestured across the lawn to a distant stand of trees. "In the wintertime, when the leaves are gone, you can see the ruins of Otto Kahn's house from here." There was a marked tone of grim satisfaction in his voice. Zach -- The CSHBC has the best peach ice cream in the world. Yet, it's ironic, that Otto Kahn's house out lasted so many of the other's, including Harbor Hill, which he wanted to top! I agree that, especially with the stonework around the windows, Burrwood's façade was ponderous at best, but the grounds were indeed lovely. 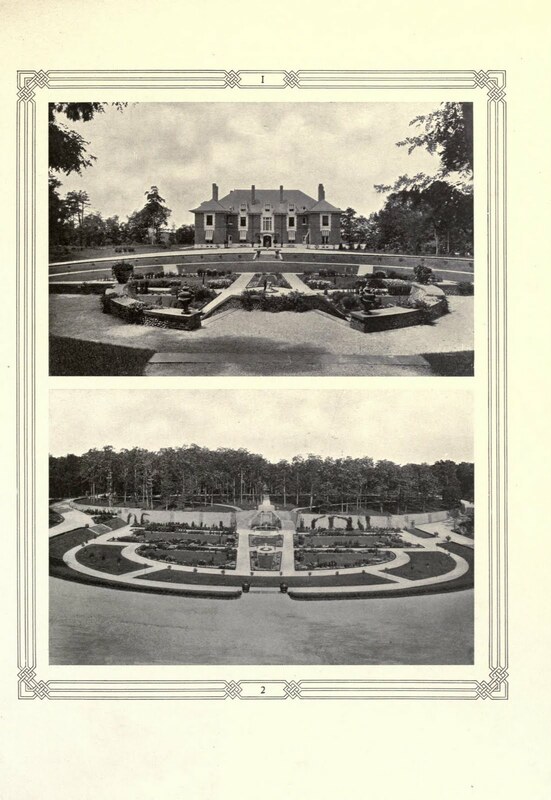 My grandmother (who lived in a house built on Harbor Hill after it was demolished) sometimes volunteered at the Burrwood Home for the Blind, and I recall that there were little braille plaques identifying the plantings in the gardens for the residents. rechi - how one feels after eating spoiled shellfish. oh - puh leeze !!! large, bulky, ponderous but thats the point. if you've got the cash, make it bigger and obnoxious. defile 15th century castles and monasteries. these guys weren't the arbiters of good taste. they just had lots of money and wanted to be as out there as possible. i say go for it and they did. that's why i love this site. the houses were handmade with as much money as possible. you don't see many solid marble halls in dilletantes federals. the bigger and more garish the better. love the garden. ps - i just looked at all the burrwood posts and it said "demolished to make way for development. what development - there are no houses in that area - what happened? and magnus - i still don't agree - this place is imposing and has all kinds of great great house touches esp the palladian window and those eyebrow like projecting eaves - just spectacular - big and beautiful. what development - there are no houses in that area - what happened? There are seven or eight houses there, and some of them -- and I say this reluctantly -- are very, very nice. In an over-the-top, junior investment banker sort of way. It was developed but not in the Levittown sense, a new house replaced Burrwood and 3 or 4 more houses were built surrounding it. Not much. Still...Burrwood's interiors were amazing. I'm sure the new houses, no matter how nice, compare. zach, Regarding Burrwood (which is now on the market cor $14,600,000.00) I don't know who "The Ancient" is but the oil tanks were put next to the beach club by Otto Kahn. Jennings did have a feud with a female attorney who lived along Shore road but I've forgotten the cause of that feud.